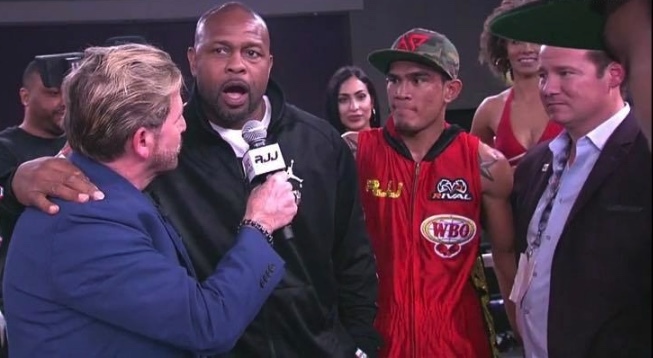 Viejas Casino & Resort, Alpine, Calif., January 31, 2019: At the conclusion of Aston Palicte’s victory over Jose “Chiquiro” Martinez on Thursday night, which took all of five minutes and 18 seconds, we see the show’s lead announcer James “Smitty” Smith asking the show’s co-promoters Roy Jones Jr. and Keith Veltre for their comments on Palicte’s dominant performance. With the 28-year-old “Mighty” Aston Palicte from Bago City, Philippines, easily defeating Jose Martinez (20-1, 13 KOs) and having a record of (25-2-1 with 21 KOs) and ranked No. 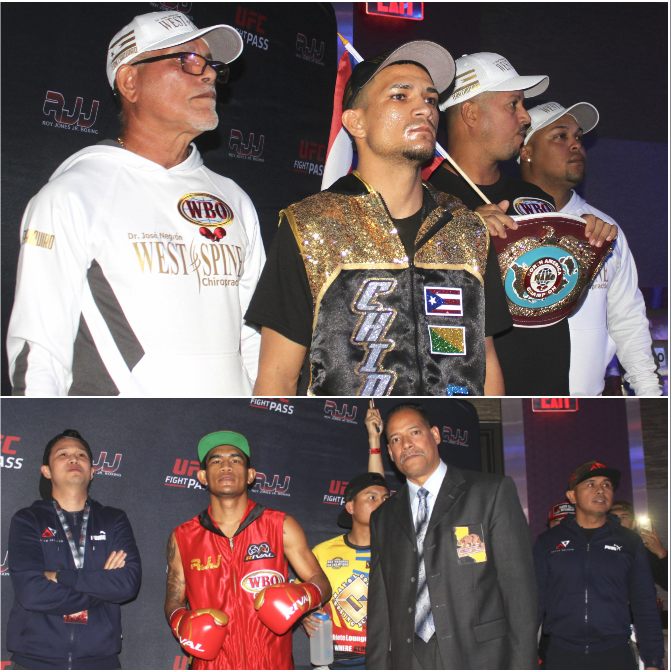 2 by the WBO, surely they would now be in a position to ask the WBO for a rematch with the current champion Donnie Nietes. In their previous contest, which aired on HBO back on September 8, 2018, Palicte ended up with a Mixed Decision Draw versus the Champion. 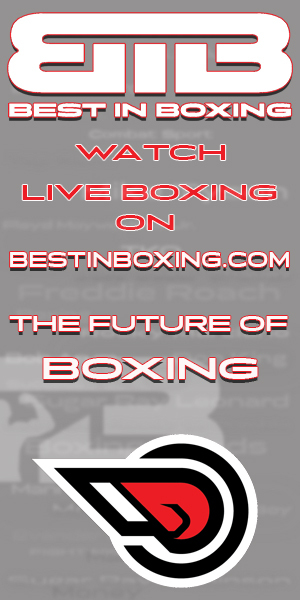 Even though that earlier bout for the WBO title had been declared a Mixed Decision Draw, it’s unlikely you’d be able to get Harold Lederman to agree. The legendary boxing judge/analyst and ringside scorer for HBO was quite adamant that Nietes had won and won convincingly. On that night Lederman scored the bout 117-111 for Nietes and Compubox, the people who track the blows, had Nietes landing 194 of the 523 punches he threw (37%), while Palicte connected on far less, just 124 of 830 (only 15%). Another thing to point out is this business of how boxers are getting so good at re-hydrating from the day of the weigh-in to the night of the fight. 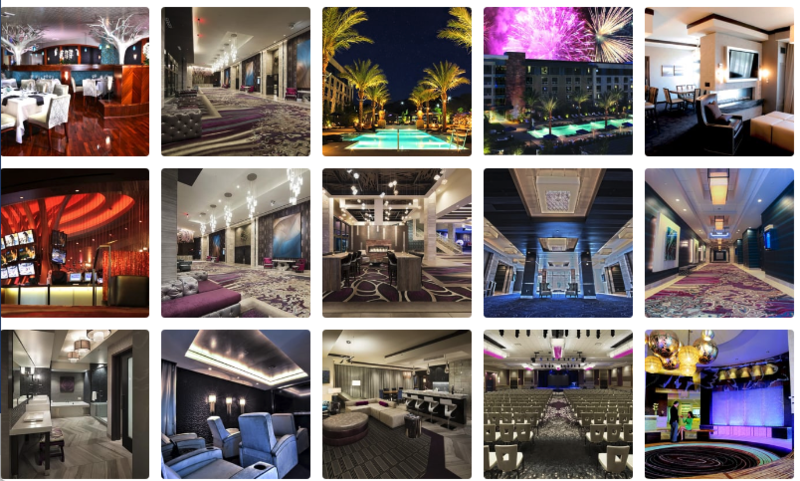 On Thursday evening, inside the Casino’s Oak Ballroom, there were the two boxers awaiting their introduction and you could clearly see who was the bigger, stronger man. As a result, Palicte’s punches did more damage than Martinez’s punches. And, by round two, after two straight 8-counts, there was referee Raul Caiz Jr. stepping in to stop this one sided bout. As an observer at ringside, it was clear Palicte had been able to re-hydrate much, much better than his opponent. 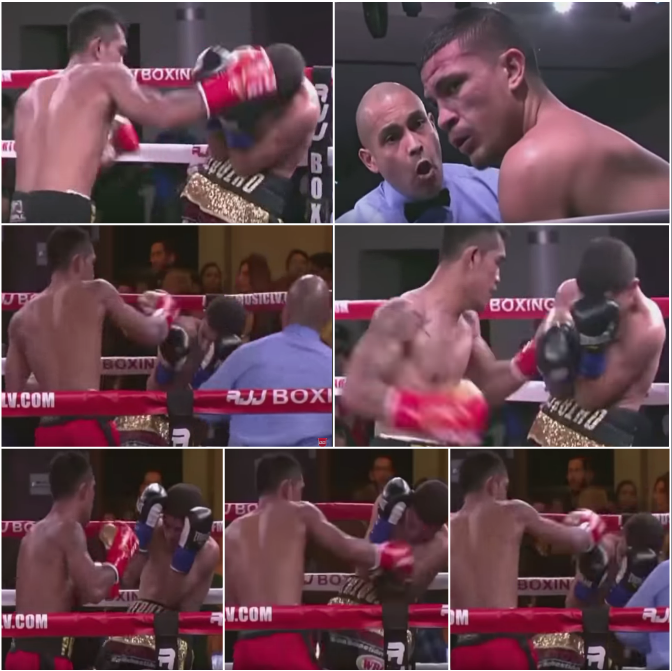 With Aston Palicte banging away at Jose Martinez’s head, Martinez spent the majority of his time covering up from this onslaught of power shots to the top of his head. 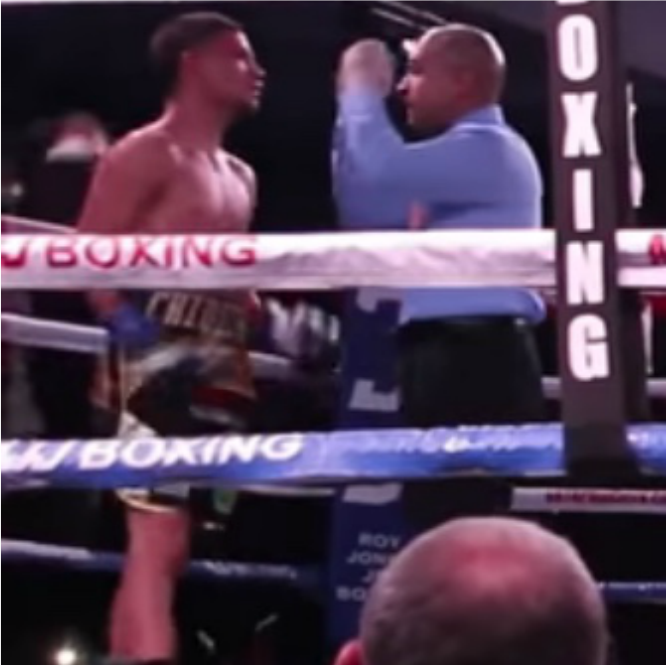 This was the first of three stoppages by referee Raul Caiz Jr. as it became crystal clear Jose Martinez (l) was getting the worst of it. The bout soon turned into a one sided beat down. After getting clobbered repeatedly, especially to the top of his head, all Jose Martinez could do was try in vain to cover up. Imagine this! 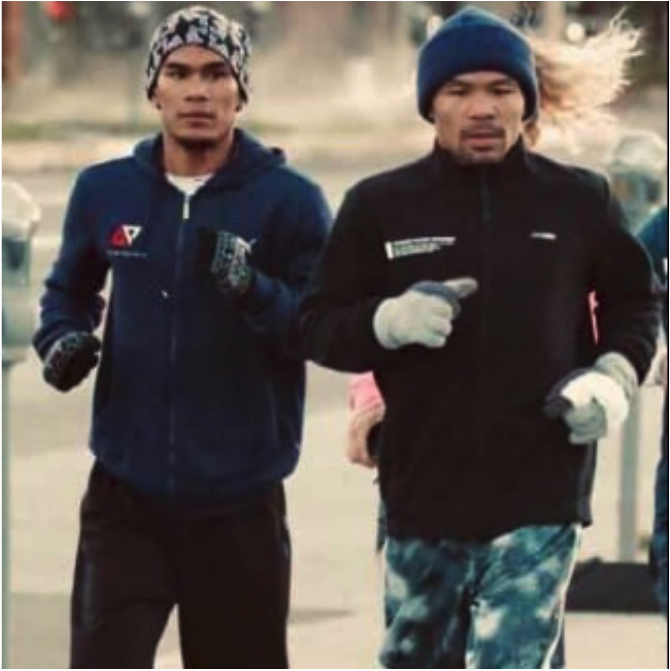 In preparation for his fight, Aston Palicte was working out with the great Manny Pacquiao. 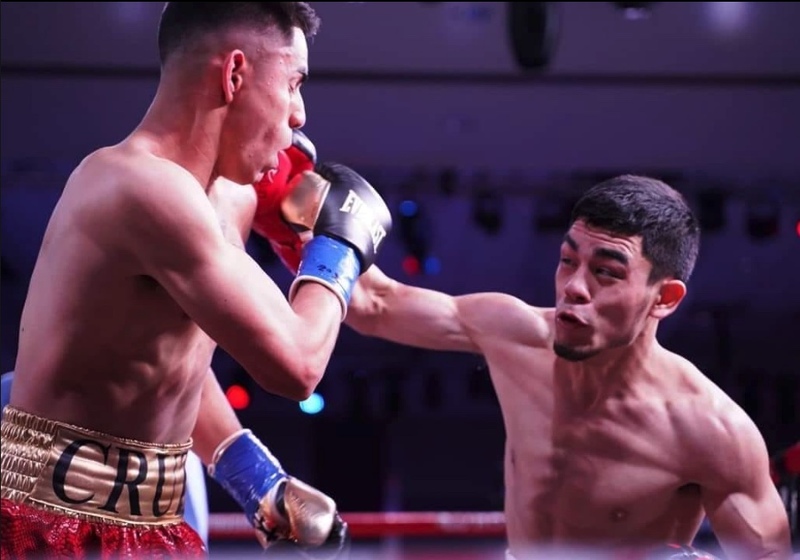 In the opener, Bout #1, it was Dilan Miranda (4-1, 3 KOs) of the Bound Boxing Academy, Chula Vista, Calif. taking on Daniel Constantino (2-2-2, 1 KO) from Compton, Calif. in a six rounder. 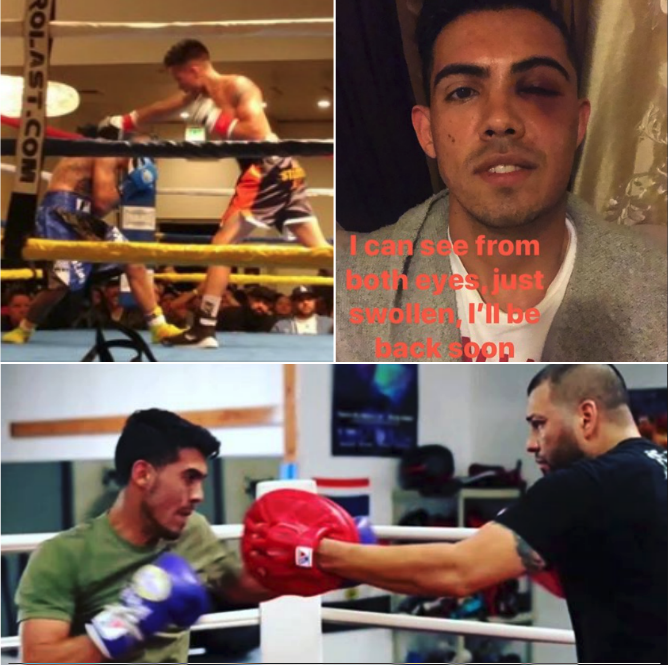 On December 8, 2018, Miranda suffered his first KO loss to a boxer by the name of Anthony Reyes from Coachella, Calif. Usually, when a boxer suffers a loss by TKO/KO, it’s mandatory they take time off and avoid any head trauma. 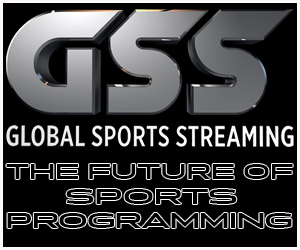 Your State Athletic Commission, in this case the California State Athletic Commission demands it and would normally issue a suspension to the boxer. Why the CSAC allowed Miranda to fight so soon, 54 days after his last bout needs to be researched. In this current show, Miranda’s injury was again to the head. An ugly swelling occurred on the left side of his face. As of Thursday, the CSAC now has Miranda on a 60-day suspension until April 1st. One of the scores for this bout also seems strange. Judge Ron Stevens scored the bout 57-57 while the other judges Pat Russell and Lou Moret had it 59-55 with the 21-year-old Daniel Constantino winning every round except for one. As you can see, Daniel “El Chino” Constantino (3-2, 1 KO) from Compton, CA. benefits bigtime from his staff of grizzled veterans. In the next featured bout, the old saying of “Somebody’s “O” has got to go” came into play as two undefeated featherweights, 23-year-old Edward Vazquez (5-0) (right) from Fort Worth, Texas and 20-year-old Brandon Cruz (6-0) from San Diego, Calif. faced each other. 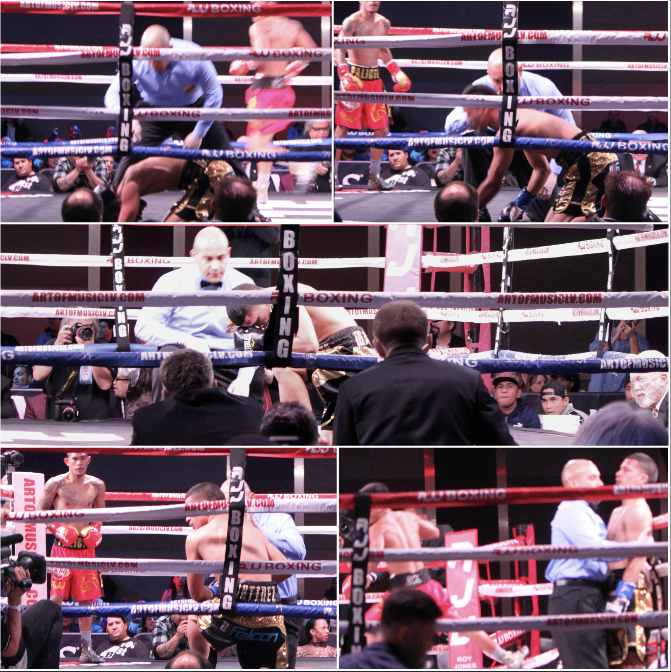 The two exchanged solid blows for six straight rounds with Vazquez working well on the inside while Cruz maintained his distance to land from a distance. In the end, two judges had Vazquez ahead while the third thought Cruz had won in their differing punch counts. 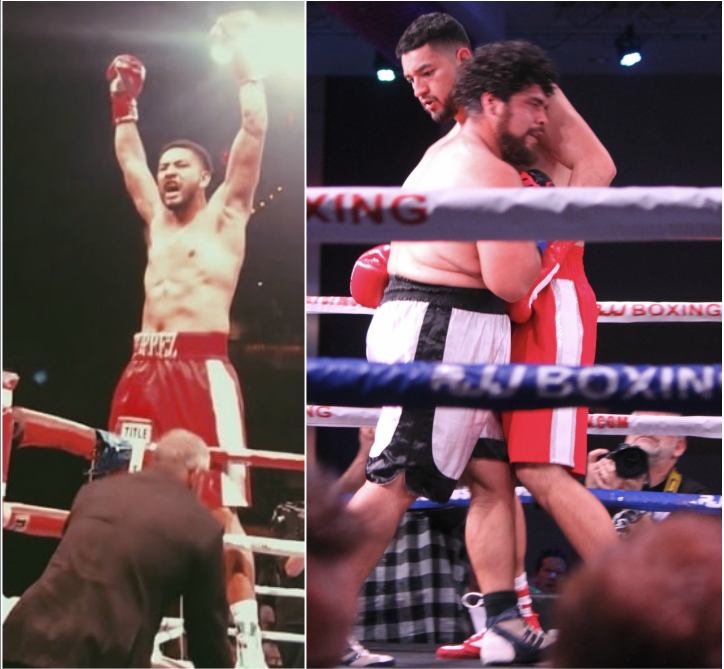 (top) Veteran referee Ray Corona raises the arm of the victorious Edward Vasquez who improves to (6-0) while Brandon Cruz (6-1) suffers his first loss. 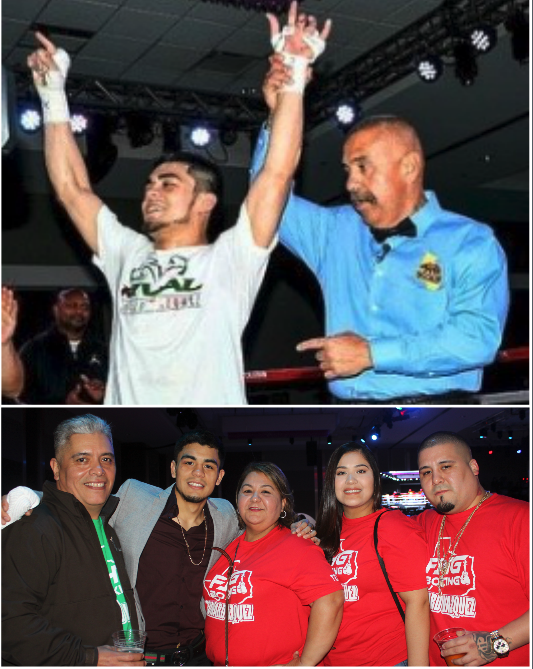 (below) The Texan Edward “Kid” Vasquez is joined by his oh-so proud family. 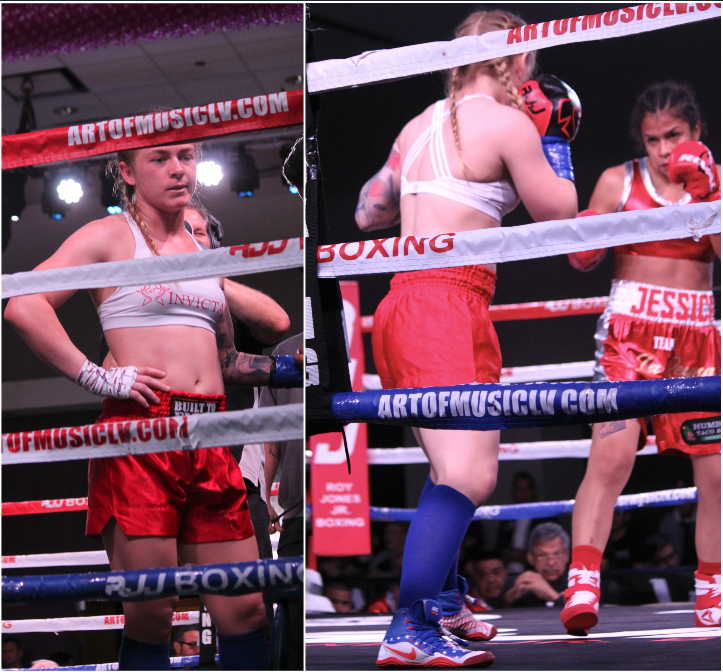 Next up, it was the ladies taking center stage in a super featherweight clash between 19-year-olds, Mixed Martial Artist/Boxer 5’3″ tall Kailyn Hansen from Whittier, Calif. (1-2 Boxing, 4-2 MMA) versus southpaw, 5’8″ tall Jessica “Kika” Juarez, a well-school and accomplished USA Amateur Boxer who began to box at the age of 8. 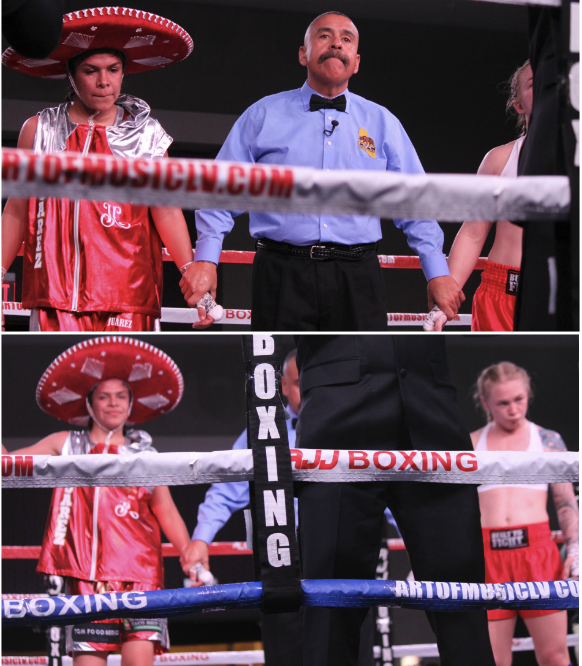 Juarez’s game plan required her to control the distance, remain calm, and simply outpoint Hansen on each of their exchanges. 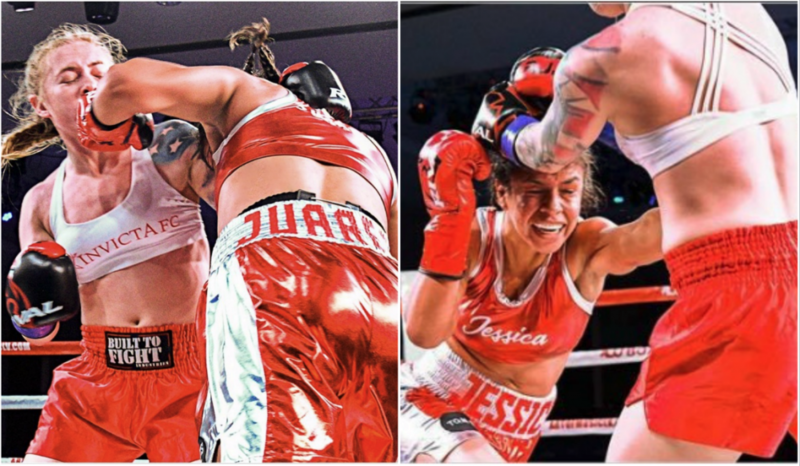 The game plan of letting the quicker hands go, hitting your target harder and more often, while remaining calm and disciplined worked well for Juarez as she won her second straight victory albeit by a “scratch your head” mixed decision. 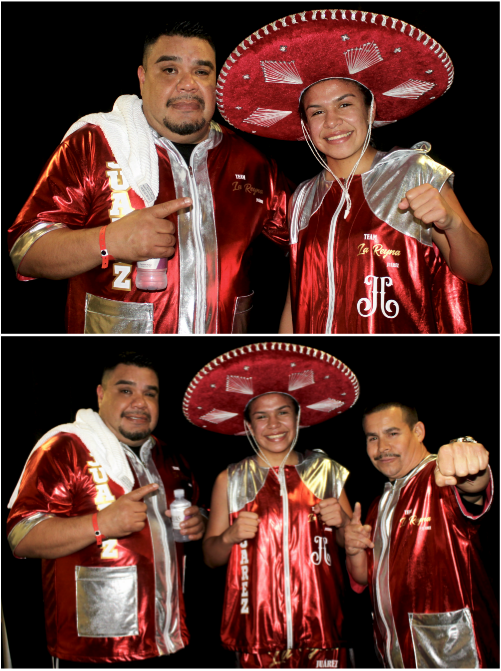 In the two closing photos we see the smiling Jessica Juarez with her Dad and co-trainer. 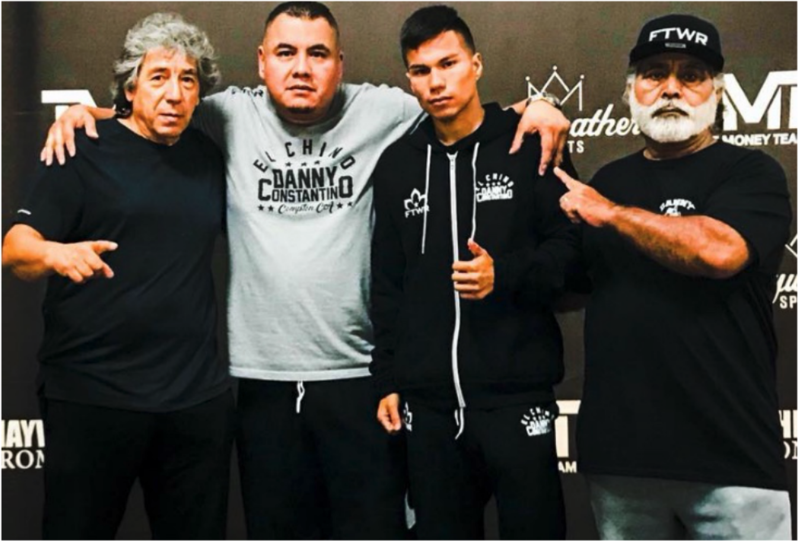 With the 26-year-old David Morales (2-2-1) returning to boxing after a seven-year layoff, you could see he was a little rusty. 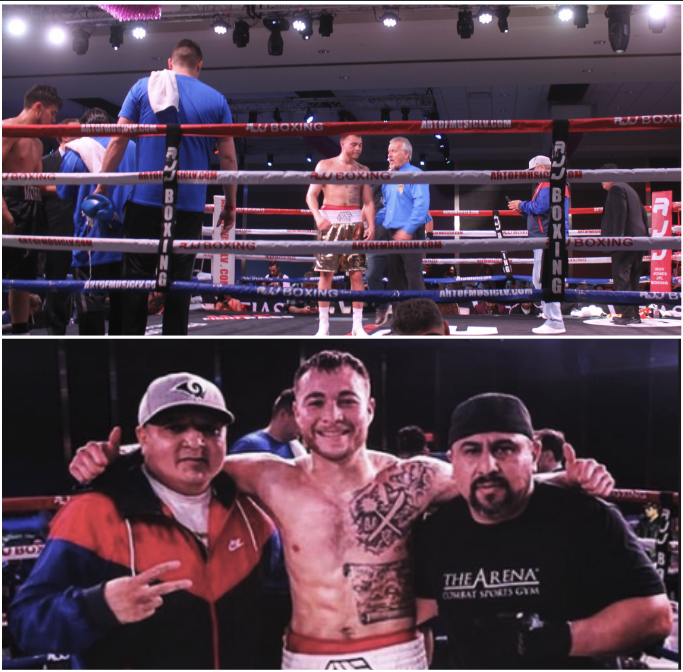 Meanwhile, Anthony Franco (4-1-1) keeps winning with the help of his manager Henry Ramirez of Riverside, Calif. and Joe Vargas, the Head Boxing Coach at The Arena in Point Loma, San Diego, Calif. In the final bout of the evening they featured the 215.8 lb., 6’4″ tall, 27-year-old Oscar Torrez (3-0, 1 KO) taking on 222.8 lb. tough guy 29-year-old Ignacio Zambrano from Torrance, Calif. I would like to say, they saved the best for last but…Zambrano is one of those fighters who will continually tie you up and make you look bad by dodging most everything you throw at him. That being said, Zambrano is one tough hombre who not only mixes it up in the boxing ring but he also fights in several other disciplines such as Muay Thai. At the end of this four round match, Torrez had maintained his cool to secure his fourth victory without a defeat. On hand to host the Roy Jones Jr. show at Viejas was none other than James “Smitty” Smith. To quote Ring Magazine: “Whenever James “Smitty” Smith enters a room, it’s difficult to mistake him for anyone else. 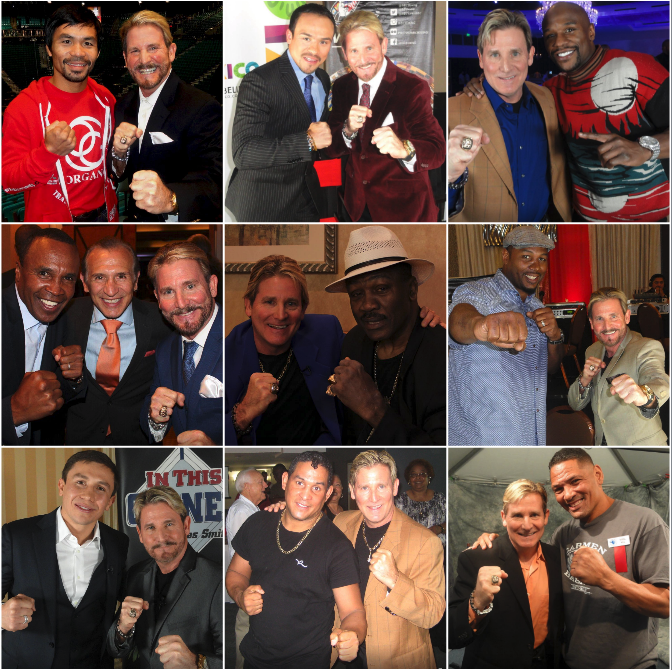 If the Miami Vice-style suits, the shock of electric blond hair and the hawk-like eyes aren’t enough to distinguish him, the attitudinal package will – the confident stride, the staccato twanged voice that cuts through the air with his strong opinions.” Name one person who has had their photo taken with more Boxing celebrities than Smitty. Getting right to it, on Smitty’s Boxing show In This Corner most interviews take place inside the ring. In five days, Tuesday, February 5, 2019, this popular Boxing celebrity will be celebrating his 60th Birthday. Well, well, looky here. 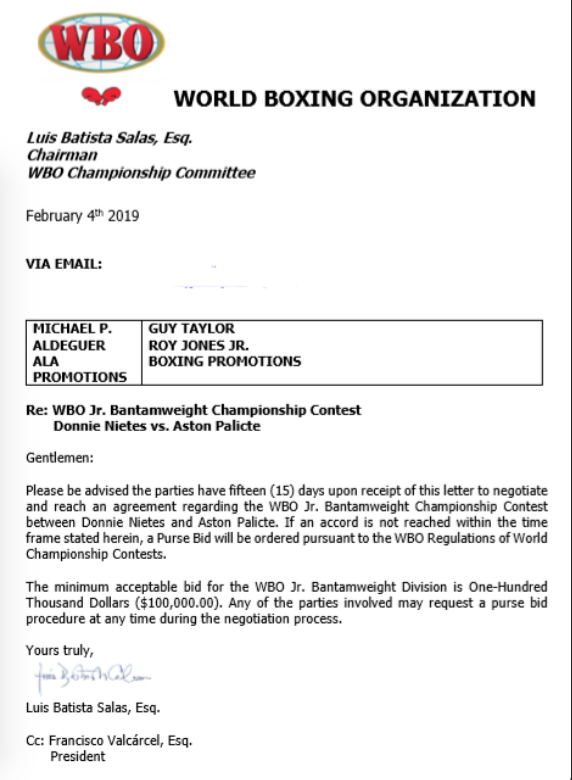 It took the World Boxing Organization all of four days to have a proposal written up and placed in front of the Roy Jones Jr. Boxing Promotions group. 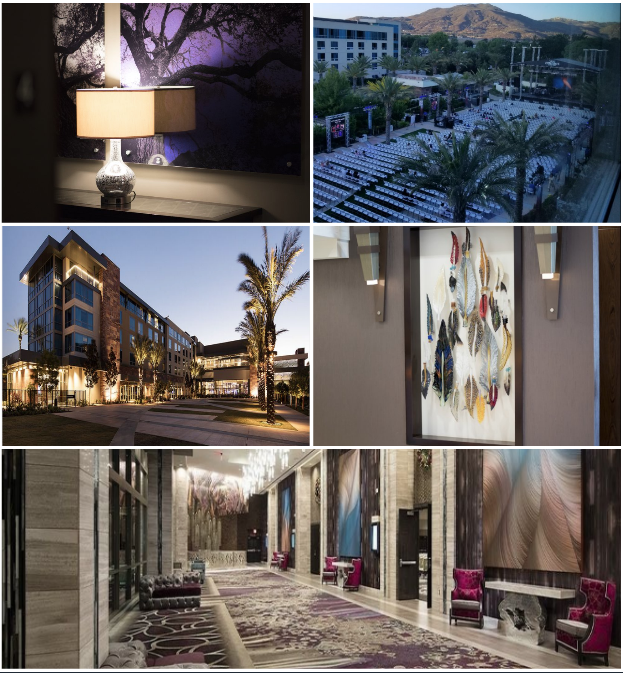 Before we forget our host of Wednesday and Thursday, it’s important to note the major improvements we saw at the Viejas Casino & Resort. 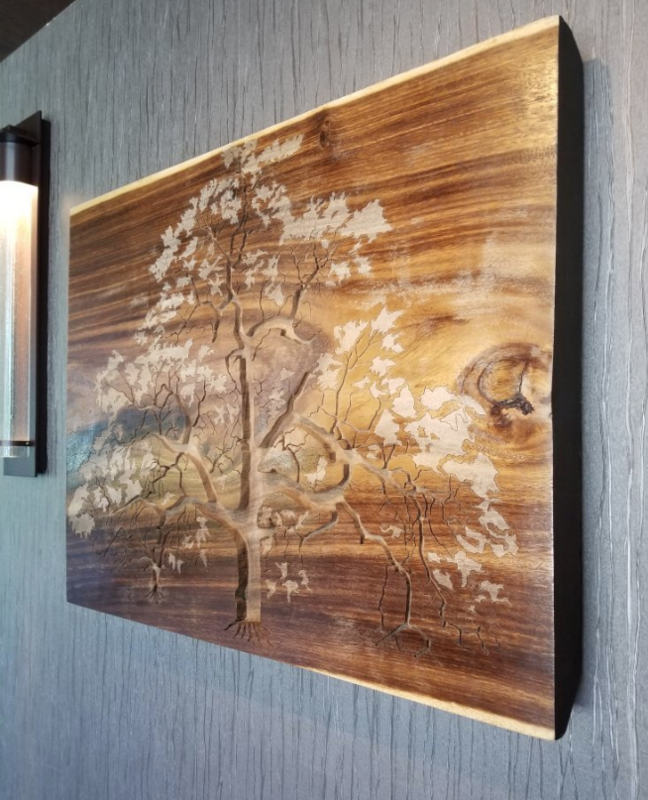 Someone or a group of someones have been doing a terrific job of introducing their guests to major works of art. 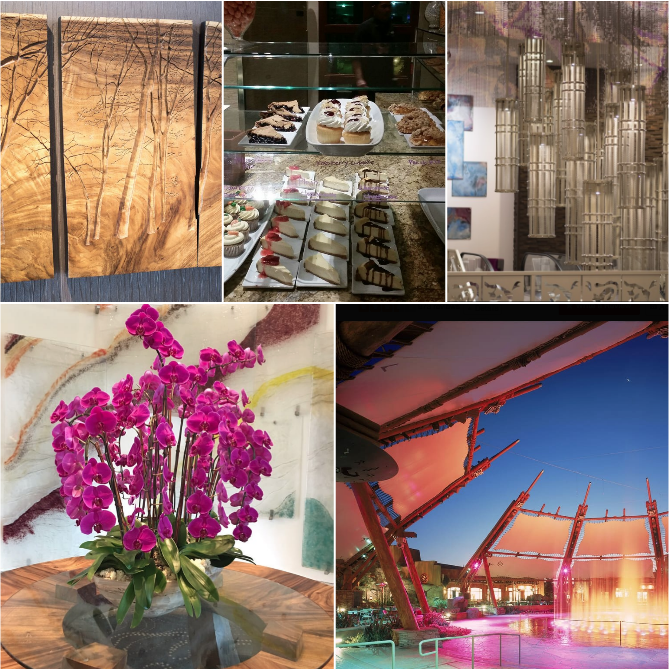 Where as the art museums around the world specialize in a certain types of art, Viejas should be commended for being more eclectic with their Metal Art, Impact/Specialty Art, Embroidery Art, Creative Art with the Modern to Ultra Modern touches. 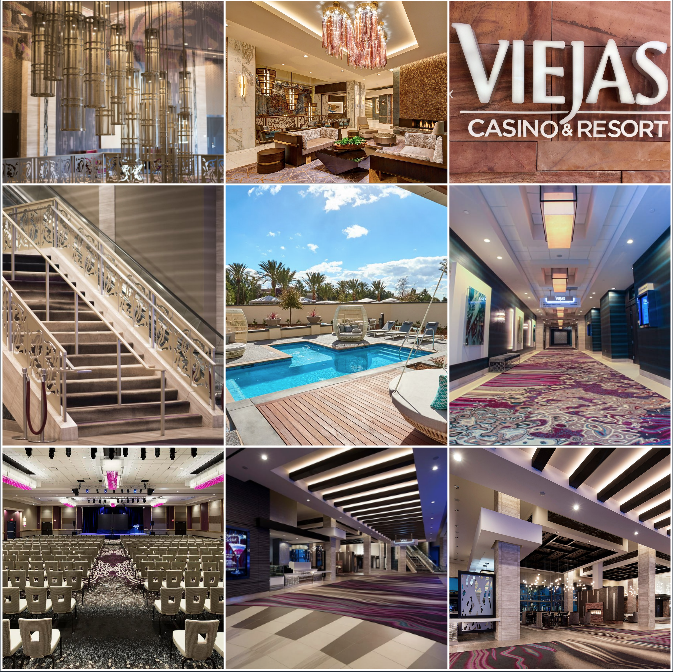 After being a recent guest at the Pechanga Resort & Casino in Temecula, and being surprised by all of their upgrades, I now discover Viejas has raised the bar. Congratulations! And continued success on blowing people away.